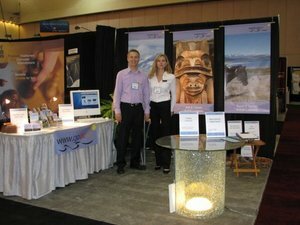 GoBC was an exhibitor at the Hospitality Tradeshow in Vancouver which took place on November 24th and November 25th, 2008. It was our first time to exhibit and it was quite the experience. It was great to connect with so many of our participants, explore new relationships and also talk to many of the other exhibitors. We noticed a great mix of attendees, especially restaurants, pubs, accommodation and tour businesses. Thanks to Vancouver Island artist Rick Silas we had an amazing display with his fabulous table made from cold bend glass.